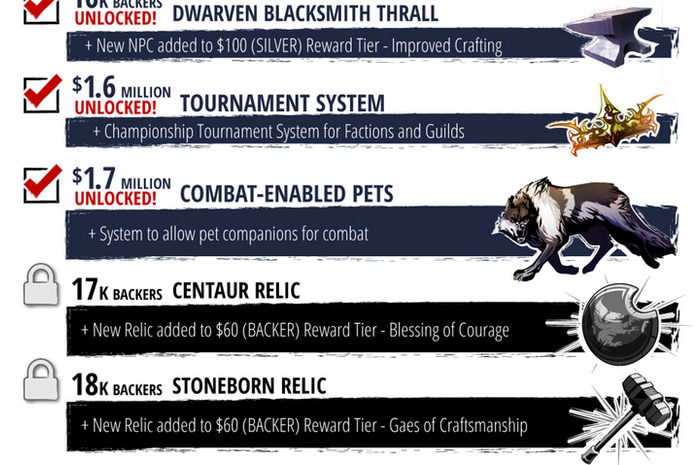 With only two hours remaining on the Crowfall Kickstarter, will the thone war MMO achieve $1.8 million? [Edit] Crowfall is officially funded, ending its run on $1,766,205 USD raised, with 16,936 backers. Congratulations ArtCraft Entertainment! There's only two hours left on the Crowfall Kickstarter and at the time of writing, the game has racked up a massive 1.7 million dollars. With over 16,000 backers it looks like the Stoneborn Relic stretch goal isn't going to be reached, but there's every chance that the Centaur Relic, requiring 17,000 backers, will be. Overall I think ArtCraft Entertainment will be thrilled with the excitement surrounding Crowfall and needless to say, in a short while they'll be in control of a lot of peoples money. If you don't happen to have the money to back Crowfall just yet, not to worry. A few days after the Kickstarter closes ArtCraft will be opening up their own store over on the official website, similarly to Camelot Unchained. If you can afford to, head on over to the Kickstarter to lend your support - there's still time.